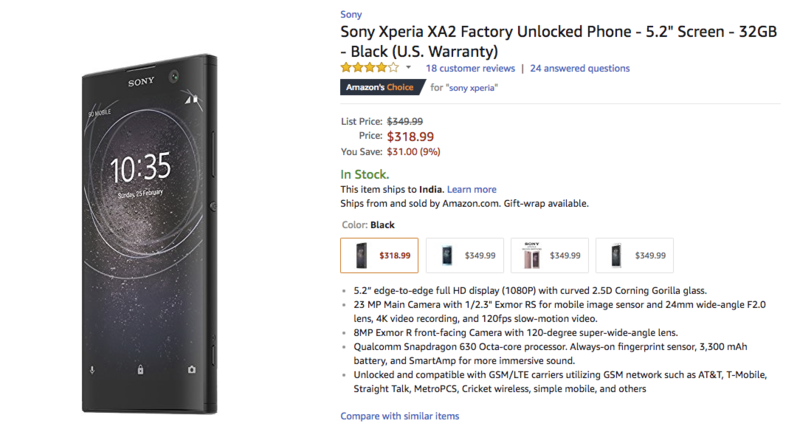 Sony Xperia XA2 which was announced at CES last month is already in the news by getting a $32 slash on Amazon and Newegg. This midrange device is currently going for sale at $317.99 for the silver color variant on Newegg while the Black color variant is available for $318.99 on Amazon as well as Newegg. This makes a total saving of $32 and $31 respectively for the Silver and Black color options of the Xperia XA2. The device comes with 5.2-inch IPS LCD display with 1080 x 1920 pixels resolutions giving 424 ppi. The display is also protected by minor scratches and falls by Corning Gorilla Glass 4 on top and has 75 percent screen to body ratio. Under the hood, there is A Qualcomm Snapdragon 630 Octa-core processor with 2.2 GHz clocking speed, coupled with 3GB RAM and Adreno 508 GPU. Out of the box, it will come with the latest Android 8.0 Orea operating system and is expected to get further updates. The device supports dual SIM connectivity but the second SIM slot is a hybrid slot that can be used for secondary SIM card or to insert a microSD card. The onboard storage is 32GB which can be extended further with microSD card if needed. There is a 23MP rear-facing camera with LED flash, autofocus, and Phase detection which will be accompanied with 8MP camera on the front. There are other connectivity options like Wi-Fi, Bluetooth v5.0, GPS, A-GPS and few more. There is also a fingerprint sensor on the rear and has a 3300mAh non-removable battery on to power the handset. Are you planning to get this mid-range device from Sony? Do you think this smartphone will get further discounts? Will you get it from Amazon or Newegg? Comment in the section below and let us know if you have more queries on the same. Stay tuned to Android Advices for more news and updates.